Mouseposé | Mac App Storeのアプリ検索・ランキング BuzzMac! 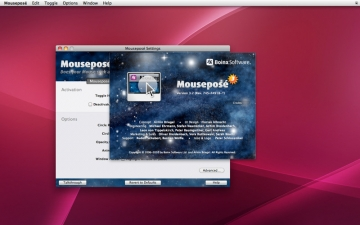 Mouseposé is the indispensible mouse pointer highlighting tool (aka "virtual laserpointer") for everyone doing demos at tradeshows, presentations and trainings, or those individuals with huge and high resolution displays. When activated, it dims the screen and shines a spotlight on the area around the mouse pointer, easily guiding the audiences attention to an area of interest or helping you to quickly locate the mouse pointer. The audience will be able to follow you much better throughout your presentation if people can clearly see what you are doing. 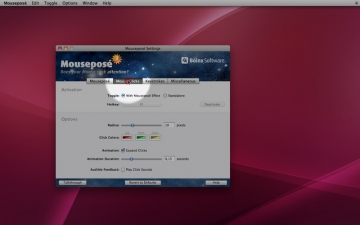 In contrast to a simple laserpointer, not only does Mouseposé highlight the mouse pointer so that the audience can follow it around your screen, it also visualizes mouse clicks by drawing a red circle (or two or three depending on the number of mouse clicks) around the mouse, enables you too choose a sound to be played when the mouse is clicked and lets you pick different colors for right and left mouse clicks. When the Mouse stays over a window for more than a configurable time, the focus automatically expands to highlight the window and your presentation moves smoothly from detail to context. 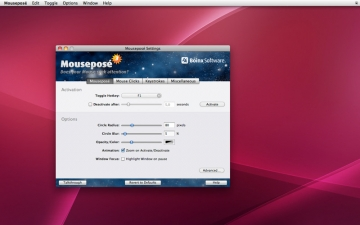 Mousposé also includes keystroke visualization to show the audience what keys you press during your presentation. With multiple huge high resolution displays connected to your computer, "find the tiny mouse pointer" has become a popular game. 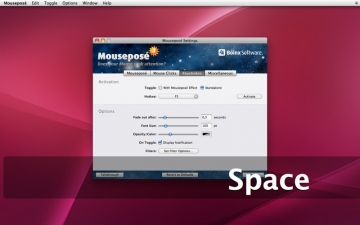 Mouseposé is your cheat, with the elegant start/stop animation being designed to draw your eyes toward the mouse pointer, wherever it might be hiding.